The 2017 Australian Open wrapped up on the weekend with Roger Federer beating Rafael Nadal in an epic final between two ageless champions. 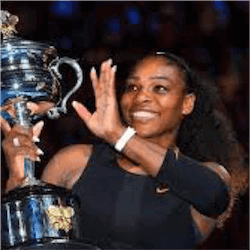 Meanwhile Serena Williams beat her sister in straight sets to claim her 7th Australian Open title and a record 23rd grand slam title in the Open era. In the woman’s final, Serena went into the match as the clear favourite against her sister Venus. But it didn’t take long for the tension to kick in as she smashed her racket in frustration in only the third game. Serena has broken serve in both the first and third game only to hand the advantage back to her sister after a string of double faults. After a break at four games to three, Serena seized the chance to take control of the match winning nine games in a row. The crowed at Rod Laver Arena got behind Venus as she tried to win her first major in eight years. But it was not to be. Serena was just too strong, beating Venus in straight sets 6-4, 6-4 to claim her 7th Australian Open title. The 2017 men’s final turned out to be a match for the ages. Federer raced the qualifying stages and into final, improving with every match. The former Swiss champion spent the latter half of 2016 nursing and injury and not being able to play. Federer had also not won a Grand Slam since winning Wimbledon in 2012. In this year’s final, the match tended to lean towards the way of the Swiss. In the opening stages of the match, Federer remained error free and his sleek stroke-play handed him consecutive winners. It was not until the 5th game that Nadal got a handle on the match. Imposing his own trademark brand of brilliance, Nadal started to unsettle the Swiss. Federer managed to hold onto his early breaks and take the first set six games to four. Nadal upped his game again in the second set, immediately breaking Federer’s serve to lead 2-0. After securing the third game, Nadal went on to win the second set 6-3, and levelling the match. In the third set, Nadal took control again having many opportunities to break the Swiss. But it was Federer’s serve that got him out of trouble time after time. After holding his own serve and breaking Nadal, Federer raced to a 3-0 lead and wrapped up the set 6-1. The fourth set saw another change as Nadal raced to an early 3-1 lead with another break in the fifth game. Nadal closed out the set which set the match up for an epic 5th deciding set. Facing the daunting task of serving the opening game, Federer was outdone by the Spaniard going down 2-0. Just as it looked like Nadal was closing out the set, Federer came back with brilliant 6th set breaking Nadal’s serve. Federer then held his own serve after a history making 8th game, closed out the match, winning the Australian Open in front of a rapturous Rod Laver Arena.